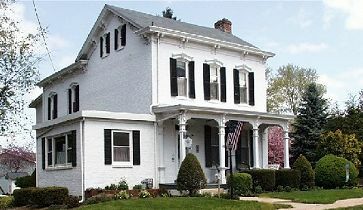 Lancaster PA Bed and Breakfasts, lodging at the Maytown Manor Bed & Breakfast in Maytown PA.
Maytown Manor Bed & Breakfast provides an inviting and relaxing retreat near Lancaster, PA. Built in 1880, this federal-style brick house - the former Hiestand Estate - offers three thoughtfully appointed guest rooms with private baths, a parlor featuring a fireplace and piano, a relaxing porch swing, hearty breakfasts and complimentary snacks. Maytown Manor provides easy access to main attractions like Amish Country, HersheyPark, Nissley Winery, Gettysburg, and Harrisburg. There are unique restaurants, antique stores, farmer's markets, and outlet malls. Maytown Manor is the 2003 winner of Arrington’s Bed and Breakfast Journal Best Breakfast Award and 2nd Place winner for Room of the Year 2002 by North American Inns Magazine! Leave the hectic world behind, 'come home' to a peaceful sanctuary, and capture that 'renewed' feeling! This and other Lancaster Bed and Breakfast Inns can be found here online in The Register.